SUPPORTERS, Because of YOUR GOODNESS During the preceding year we had enough resources to Provide 398,000 units of service and we did not have to cut services or turn anyone away who needed help. Our day starts early in Bow Street and when the staff on the early shift arrive to prepare for the day, the queue is already forming. People are often in a distressed state and we respond as best we can to the needs of each individual with respect and kindness. Breakfast is served between 7am and 11.30am and we normally have between 250/300 people. With extra on a Wednesday, people on the margins come to collect groceries also have breakfast. It is easy to spot the “rough sleepers” - those who have spent the night on the streets or slept in cardboard boxes. In an effort to regain their dignity the rough sleepers are usually the first to put their names down for the showers/fresh clothing while others are so dispirited and exhausted they just need a safe place to get in out of the weather and rest before they have their breakfast and face another day. Our busiest morning is Wednesday and the staff/volunteers arrive at around 6 am to make up food parcels for about 1,400 people who need help with their grocery supplies. Today’s economic reality is that people have to choose between paying their Rent, ESB/Gas etc. or paying for food. (We also provide 350 parcels each week from the friary in Kilkenny). At about 11.30 we close for a short time to prepare for the busiest part of our day and get ready to provide a full dinner for 5/600 people. Clinics - While the main purpose of the Centre is food maintenance, we have consistently endeavoured to improve our response to the emerging needs by adding extra dimensions to the service and help people who have difficulty accessing mainstream services. We are eternally grateful that as well as our collaboration with the Safetynet Primary Care Service who provide 4 GP Medical Clinics each week, we have other Professionals who offer their services on a completely “Pro Bono” basis. These include two Dental and two Chiropody clinics each week, an Optical Screening Clinic every fortnight and Haircuts (Haircuts 4 the Homeless) every month. Our latest additions include a Cervical Smear Screening service and a COPD and Diabetic Clinic run by the Mater Hospital. Clothing and Practical Assistance – Apart from food aid and thanks to your goodness, a sizable portion of our expenditure is on footwear, socks, underwear, t-shirts, emergency rainwear, tents and sleeping bags, personal hygiene products, hospital packs, hats, scarves, emergency transport costs, assistance for bereaved families etc. baby supplies and children’s essentials. While we distribute donated clothing, for health and safety reasons, we prefer to supply new clothing where possible. Child Poverty/Emergence of the New Poor - While it breaks our hearts to see anyone in need of food in 2017, it is harder for the families with children who are rushing to make it for dinner because they have no money, or a home with proper facilities to cook for themselves. For us Capuchins the welfare of families is a priority and for this purpose we established a designated “Family Area” section in the Dining Hall where children and their parents can enjoy a nutritious meal in safety. In contrast to the “INACTION OF THE GOVERNMENT” to the Homeless Crisis, we Capuchins are astounded at the level of KINDNESS BY OUR SUPPORTERS who help keep this lifeline for people in need going. Given the current situation which many campaigners are calling to be upgraded from a “Homeless/ Housing Crisis” to a “National Emergency”, it looks like we will have to continue with this apostolate for some time to come. 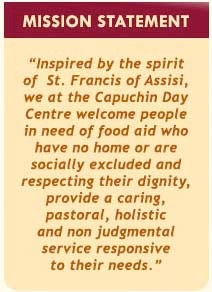 On behalf of the countless people in need who have availed of the service and the Irish Capuchin Franciscan Order, our sincere thanks and prayers that God and St. Francis reward you with many blessings.